Kenyan David Rudisha sets the first world record on the Olympic Stadium's athletics track as he wins the men's 800m in a time of 1:40.91. Silver goes to Nijel Amos of Botswana and bronze to Kenyan 17-year-old Timothy Kitum in a personal-best 1:42.52. Great Britain's Andrew Osagie finishes last but in a personal best time of 1:43.77. 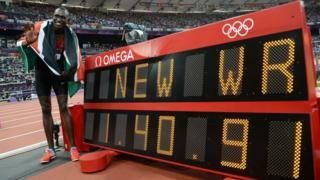 After the race Rudisha describes the race as "unbelievable" and says he is very happy to have broken the world record.